My favorite time of the year approaches. I’m likely biased because I was born in the autumn, but I can’t help but anticipate the seasonal shift from the hot sweltering summer days into the cool, darker fall evenings. Fall brings the promise of cozy sweaters, longer nights; dazzling color displays from the trees, wonderful smells, and delicious foraging opportunities on a cool daytime hike. The most important thing this season signifies to me is that it’s the time to put up the summer season’s harvest…. fall is the time to dust off my unruly heap of canning jars and restock the pantry for the next year! Every year I try to be adventurous and prepare something new and special to add to the collection of recipes, but there are always those important go-to staples that simply must be made. Every year my apple trees dump pounds and pounds of fruit on the ground, but my eyes see jellies, applesauce, apple butter, and pies. Oh, pies. I could write a sonnet about pie. There are many things to freeze, such as fresh garlic and basil pesto, as well as berries and pumpkin puree for pies. Mushrooms are waiting to be harvested on crisp hikes and put in the dehydrator to be used later. Veggies are ripening on the vine and are ready to be pickled: peppers, cucumbers, onions, zucchini, and the always coveted spicy dill beans to be hoarded like dragon’s treasure, hidden safely from the sight of hungry housemates. There are countless other delights to be canned or preserved in other ways, transformed from fresh garden produce into foods that will sustain and brighten up those slim winter months, and make great gifts to share with loved ones at holiday time. The basics for canning are very simple, and it’s likely most of us already have a good portion of what we need in the kitchen. 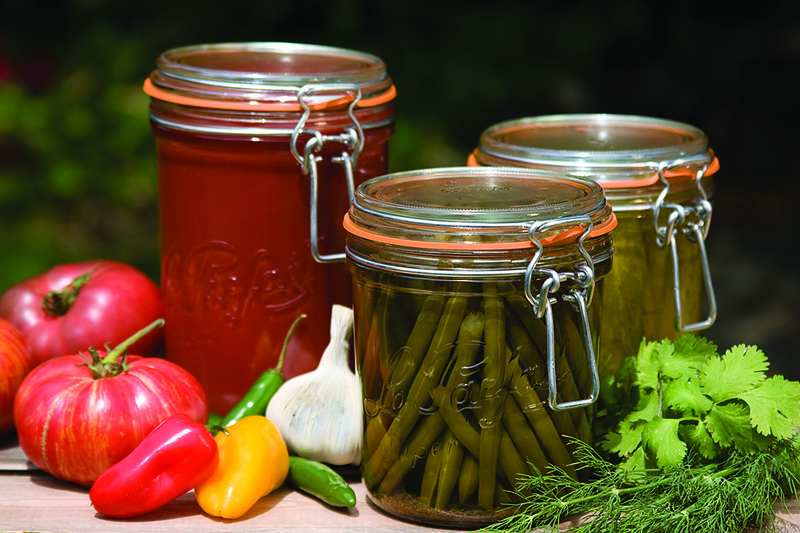 The two safest methods for canning are water bath canning, or pressure canning. Water bath canning is my love, and it is the easiest method of canning that yields amazing variety, and is great for the beginning food preserver. The difference between these two methods is all about temperature. Water bath canning is only recommended for high acid foods (anything with a pH of 4.6 or less). The required temperature for processing is 212° F, or the boiling point of water. Most of what you will can with this method is pickles, fruit preserves and jellies, or anything with high acid content such as tomato sauces and salsas. Anything low acid must be processed in a pressure canner. Since the steam in the pressure canner is under such high pressure, the temperature can raise above the boiling point at 240° F in order to kill the bacteria that can cause botulism. Common foods to can with this method are meats, stews, and vegetables. There are some excellent newer cookbooks out there with fresh unique recipes, and variations on old favorites; follow site Canning for a New Generation, Food in Jars, and Put em’ Up! are great cookbooks to get some preserving inspiration. In addition, a must have canning reference for your bookshelf is the ubiquitous and comprehensive discount viagra online Ball Book, and it contains everything you need to know as a beginner, or to use as your muse for the classics from year to year. 1. For water bath canning, you’ll need a http://cinziamazzamakeup.com/?x=levitra-originale-20-mg-in-farmacia-prezzo large sized stock pot with a lid (generally 21.5 qt. is sufficient for this purpose). You need at least 1-2” of water to cover the top of your filled jars while processing (mind your stovetop, as an electric range should hold no larger than a 3 gallon capacity); an enameled stock pot is a relatively inexpensive option at under 30 dollars, and is quite common for this purpose. 3. You’ll need some see url clean, un-chipped/un-scratched jars with new lids, and undamaged metal bands for storage. The jars range anywhere from 4 oz. to a ½ gallon in size depending on your recipe and preference. The standard is the Ball jar lids, but there is also a brand of reusable canning lids available called Tattler. They are a USA made, BPA free white plastic lid that comes with reusable gaskets that work very similarly to the Ball lids without needing to throw them away and buy new every time. The gaskets only have to be replaced if they are cut, stretched, or damaged. I bought some of these lids and have been mostly satisfied with the performance, but try to only use them on the food that I am keeping for myself, as I fear that they will be thrown out or not returned to me when given as a gift. A canner’s rule of thumb: don’t ever have the expectation of getting your jars returned when you give your goods away. 5. The http://cinziamazzamakeup.com/?x=cialis-generico-europa lid lifter is extremely handy if you are simmering the lids with your jars (lids can go straight from the pot onto the hot jars without touching them), and a http://maientertainmentlaw.com/?search=levitra-professional-no-prescription jar lifter is a definite must-have to pull your creations out of the water with a steady and unburned hand, as you want to keep those jars as level as possible until they are sealed and cooled. 6. where to buy cialis now Funnel. This can be inexpensive plastic or the more durable long lasting stainless steel. I canned for two years without a funnel, and my life has been changed since spending a few dollars for this convenience. I find I have less wiping to do on the lip of my jars before placing the lids on, and fewer counter spills. Related to the funnel, a go to link non-reactive ladle is great for spooning your liquids into jars, and canning specific ladles are made with spouts on either side for convenience. 7. A thin, plastic or silicone spatula/scraper for removing air bubbles prior to processing reduces the chance of the seal failing during the boil. You want as little oxygen as possible in the jar, only what is in the headspace. 8. A good canning/candy thermometer is essential for monitoring water to keep the appropriate temperature consistent. You will also want a reliable timer for processing. 9. You’ll want some clean dry towels on hand, and some moistened paper towels for wiping the rims of your jars before placing the sterilized lids on them. 10. You need time! Small batch canning can be done in an evening after work (think Food in Jars or Preserving by the Pint by Marisa MCClellan), but sometimes having a day or weekend set aside is helpful, as preparing your food and setting up your equipment, as well as the processing/cooling time, and cleanup can really eat up a good portion of your day. It is nice to feel relaxed and unhurried while preserving. It should never feel like a chore! 11. Label your work appropriately. Some people just write on the top of the lid with a permanent marker, noting the recipe used and the date it was made, or you can buy or make cute labels of your own to stick or tie onto your jars, especially if gifting. I also recommend keeping a journal of your canning. This will assist you in judging the proper amount to make the following year to avoid making too much (or even worse, too little) to last the year. It can also be helpful in remembering which recipes you’ve already made and which ones you liked or disliked. I find it very valuable to make notes on possible custom adjustments I can make in the future to suit my tastes. It is recommended in all the canning lore available that you consume your tasty creations within a year of canning, and refrigerate and eat them within a week of opening. The same practice goes for anything you freeze. I am guilty of having some vintage 2011 hot pickles in the back of the cupboard that I’m apparently saving for a rainy day, but bear in mind you will risk the seal degrading, creating a potentially unsafe and hazardous eating experience, as well as compromising the taste and nutrition of your food. All that being said, I hope you enjoy this year’s harvest, and whether or not you have done it before, have fun preserving and enjoy the fruit(s) of your labor!